That’s why when I started talking with the dapple team about natural laundry products, I listened closely. Because when I mean team, I’m talking about Dana Rubinstein and Tamar Rosenthal, who founded the toxic chemical free dapple cleaning products line in 2008 and are each a mother of four. Any four-time mom who wants to share her secret to getting stains off of kids’ clothes is some kind of guru to me. Yes, you read that right. Mom gurus, both of them. With eight testers in residence—from 18 months to 10 years—Dana and Tamar know from stain removal. They had already developed the bestselling a title dapple Baby Laundry Detergent that was strong enough to get the family load clean, while still staying clear of crappy chemicals like parabens, phthalates, 1,4 dioxane, optical brighteners, SLES and SLS. Ultra-mild and fragrance free, the natural laundry detergent is formulated safe for newborn babies as well as people with skin conditions like eczema. But for bigger laundry issues—from spit-up stains to tomato sauce splatters—Dana and Tamar called in the big guns, utilizing powerful natural enzymes capable of removing the toughest laundry messes. The result? 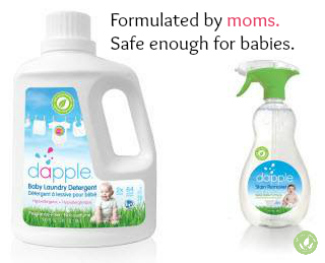 dapple‘s new Baby Laundry Stain Remover, a pre-wash spray that really works. These moms are hyper-vigilant about the ingredients they select, making sure they are biodegradable and environmentally safe. They even print each and every ingredient on product labels—unlike some of the other petroleum-based, heavily fragranced baby laundry products we don’t care to mention. And they’ve managed to marry a serious commitment to sustainability with savvy marketing skills that earned dapple key placement at Babies “R” Us, BuyBuyBaby and Diapers.com, along with other baby boutiques more intuitively inclined to embrace natural laundry products. This is mom power at its best. Want to dry dapple for yourself? Enter to win a full set of products! ← Maybe BPA Isn’t Bad for You? Is benzisothiazolinone a safe ingredient? EWG gives it a rating of 3-4 which is the same rating as phenoxyethanol. It’s a 3-4 rating, which is on the low side but still not nothing, you’re right. But there are no concerns for cancer or reproductive toxicity, which is what I’m most concerned about. The high concern is irritation, which would probably be true of anything that you are spraying onto clothes and then washing, you don’t want it in your baby’s eyes or on their skin. I hope this helps! Hi! I’m on the dapple website and looking for the stain remover but I’m not finding it. Any ideas where I can buy it?